In this age of problematic snow, the trails at Razor Hone (at the bottom of the hill) are often suffering from too little snow and too much rain. Meanwhile, the “White Salmon” trails are often above the rain line and can be beautiful – both quality of snow and of views. The first mile of trail is relatively level with no surprises. As you drop down to the second hairpin, note that the trail starts going downhill and you should ski under control and remember that you will have to ski back up. 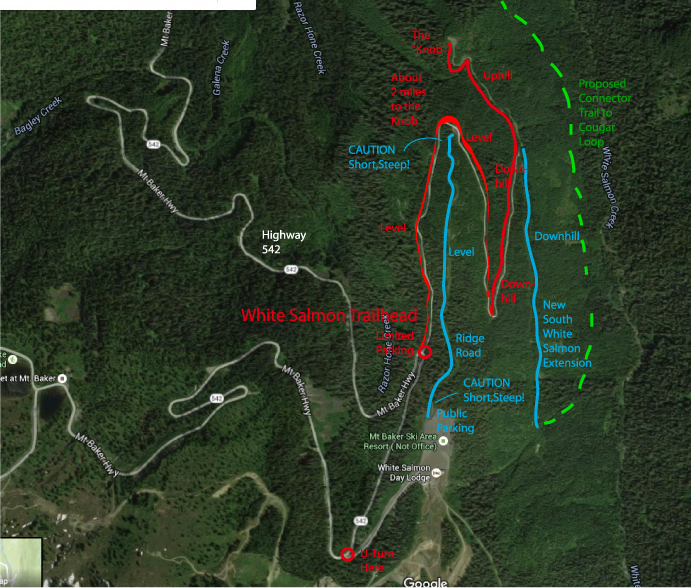 The trail branches off to the “New South White Salmon Extension” which drops at a reasonable grade down to some additional views of Mt. Shuksan. The main trail reaches a low point and then climbs back up to the “Knob” with additional views. The parking area is at Mile 51.5. It is *strongly* suggested to drive on to the turnoff for the ski lodge at Mile 52, make a U-turn, and then drive back to the parking area. (Going uphill, it is a blind corner.) As you park, please remember that other cars might not be able to pull uphill behind you – allow them to drive out downhill. The trails are obvious – don’t worry about getting lost – go out and enjoy the winter!